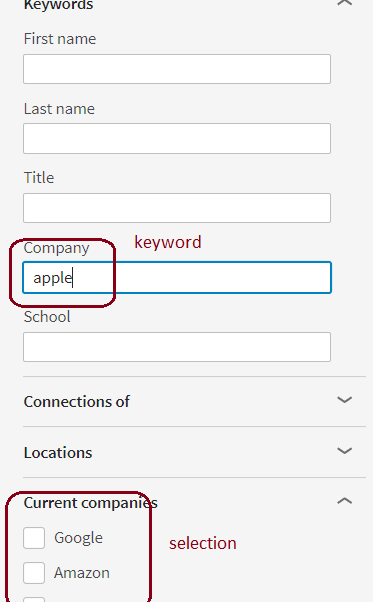 Returning to Recruiter – if you select a company from the offered list in the “company or boolean” field, it will NOT search for the keyword, but will just for that company. Thus, it only duplicates the exact same functionality found in another corner of the same vast people search dialog. If I go with the company choices, I would need to select each entry separately. 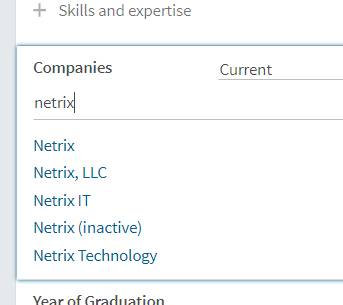 If I only select the first entry, “Netrix”, I get only two results for members whose company is “exactly” Netrix. Here is a sourcing challenge for my readers who also have LIR (Recruiter). Suppose we are searching by one keyword in the “company or boolean” field, and that word is not, by itself, a company name. How will the search be interpreted? P.S. In response to Katie’s comment and question below, I have found the shortest string that would look for the keyword, not the company. Just add a space after the word, and get many more results! See below. (The troubling thing is, the same bizarre syntax rules apply to the Job Title). I tried the keyword Wells in lieu of Wells Fargo and all but a few of my results had the last name Wells. Can you explain and show another example of the Netrix OR aNonExistingKeyword search? Would this be simply (Netrix OR) but entered without the parentheses in the keyword field? When I ran this, it returned a variety of the Netrix company listings in LinkedIn. Thanks for the comment. I use the company field, just alter the syntax for it to responding to the keyword properly. Obviously, per Boolean rules, if you are searching for word1 OR word2 and are sure that word2 is not present anywhere, you are going to always find word1. That explains the suggested method. In response to your comment, I tried playing with the search again and found that just entering a space after the keyword works as well. That doesn’t make any sense, but it works this way. Thanks so much for outlining this Irina. Good overview Irina thank you. 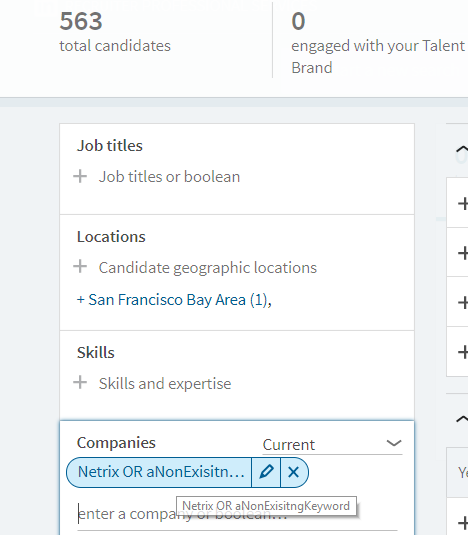 I use Recruiter Lite and I’ve always constructed Boolean strings in the ‘companies or boolean’ field because of ‘not trusting’ LinkedIn’s prompted companies from its index and of course to be able to capture all of the variants needed. GSK is a classic one with GSK OR GlaxoSmithKline OR “Glaxo Smith Kline” OR “GlaxoSmith Kline” OR “Glaxo SmithKline” to name but some! If there are any Sales Navigator users out there, we have noticed that the Companies field seems to behave differently again there (but also sometimes erratically and inconsistently over time). Our practice for Sales Nav is to use quotes around the single company names eg “Vodafone” which seems to force the treatment of the term as Boolean rather than an indexed company name. In my mind I was thinking of it working in a similar way to a verbatim command, but perhaps it is less sophisticated than this – given your experiment with the extra space Irina! Thanks, as always, for your thorough observations. b) by the company *object* within LinkedIn, that has a company ID (a long number). 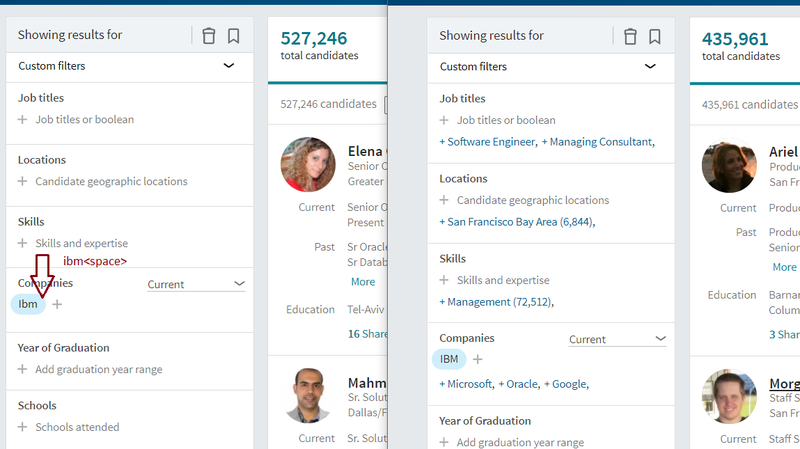 Because when people add jobs to profiles, LinkedIn prompts with the company (“object”) *selection*, most people are likely to point to company objects. Thanks for this Irina! I’ve shared it with my team. 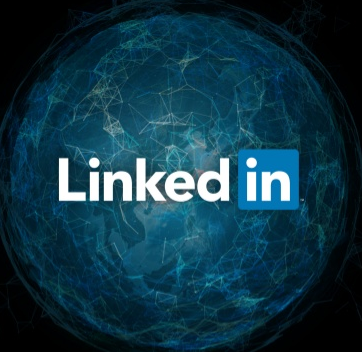 Answering to your question, if you enter a non-existent company name LinkedIn Recruiter reads this as an specific company in quotation marks. It will pick this as if you had selected this specific non-existent company name from the drop-down menu. BTW I’m not getting more results adding a space to a job title vs selecting from the drop-down menu, in fact the opposite. It’s in LinkedIn RPS. Job title is consistently getting less results if done through this way, I have tested across my team. Also sometimes we are getting mixed results for the company name. Occasionally, when writing the name of the company and pressing enter it gives the same results as adding an space after that.